Italian design company, Abhika released its first collection of interior decorations and home furnishing in 2008 with the ambitious purpose of creating a total look for elegant homes, smart hotels and refined public spaces. Located close to Venice, in Italy, their credo is fearless design and they’re inspired by other leading designers and architects around the world with whom they sometimes collaborate. 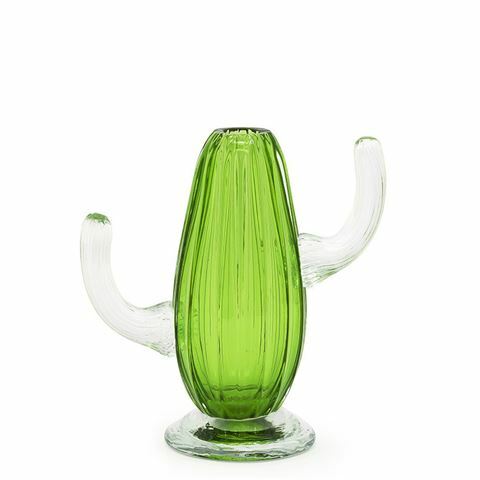 Bring the desert inside with this luminous Vetro glass Cactus Vase, which is both beautiful and quirky. The lines are so fluid that it's almost a shame to fill it with flowers but it's sure to make your arrangements even more creative. Crafted from Vetro Fine Art glass. Clean with a damp cloth after carefully loosening any residual wax. Dimensions: 19cm (l) x 25cm (h) x 8cm (w).